Centuries are considered to be the primary milestone of success for a batsman. It's no wonder that the term 'nervous nineties' was formed, which refers to the nervousness a batsman feels when he has scored more than 90 runs in an innings, because of the pressure and desire to convert this into a prestigious century. Centuries are hard to come by in the shortest format of the game. In its 10 year history, the IPL has witnessed just 47 centuries. There have been almost as many scores in the nervous nineties as well. This is not just because of the pressure factor, but also because of batsman being stranded in the nineties owing to shortage of deliveries. This list would be incomplete without David Warner as the destructive southpaw has been stranded/dismissed in the 90s a record five times. The run-machine has time and again proven to be a match-winner and he did so in spectacular fashion in the crucial second qualifier in 2016. Though Virat Kohli stole the show in 2016 amassing over 900 runs, Warner wasn't far behind with 848 runs, which happens to be the second-highest runs scored in a single season in the history of the IPL. In the game, which would send the winners to the final, the Sunrisers were up against table toppers Gujarat. The Gujarat Lions put up a target of 163 for the Sunrisers to chase. 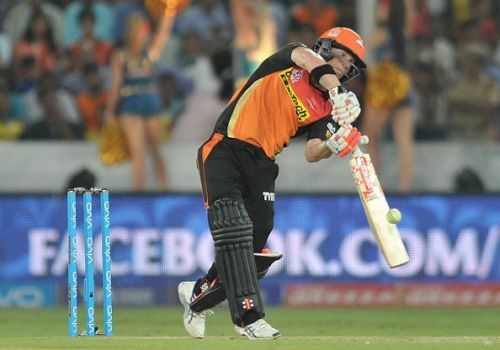 The Sunrisers were able to pull through, thanks to a one-man effort by captain Warner. Until Bipul Sharma at number 8, none of the first 7 batsmen could rack up more than 11 runs apart from Warner. In an incredibly tense chase, Warner notched up 93 runs in 58 balls to single-handedly win the game for the Sunrisers and take them through to the final which they eventually won.